The Windy Mile is a great little cafe, eatery, bar and venue to spend a Friday night or Saturday afternoon listening to a live band whilst sitting at the bar drinking a craft beer or having a delicious dinner near the warm open fireplace for those wintry evenings. Established in 2015, The Windy Mile is a local favourite. The menu caters for families, functions and events, serves, breakfast, lunch and dinner. Located on a corner block in Diamond Creek, the interior is modern and contemporary with several dining "rooms" with both communal and individual timber tables and polished floorboards. It has a warm and casual feel with friendly staff! We dined in the band and bar area and were looking to try something different, so we decided to share a German Pancake! 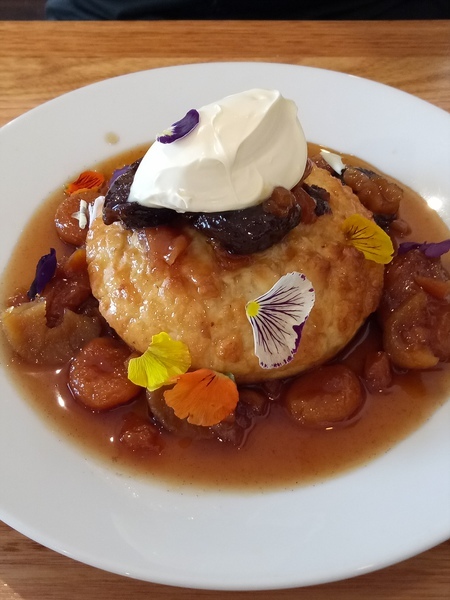 Drenched in a sweet syrup smothered with a colourful bounty of fruit compote such as prunes, apricots and sultanas. Topped with a dollop of fresh cream and edible flowers! The presentation of the dish was amazing and it tasted as good as it looked. The pancake was large and dense enough to share...YUM! Cheese Making @ The Craft & Co.